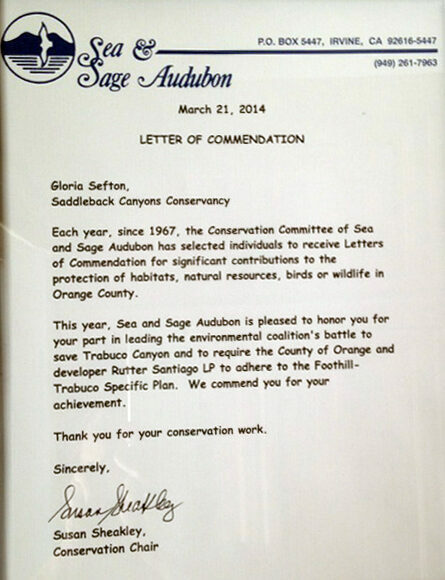 Winner of Friends of Harbors, Beaches and Parks - 2013 Green Vision Award! "FHBP hosted its annual holiday dinner [on December 4th]. We were pleased to present our annual Green Vision Awards to Gloria Sefton, Rich Gomez and Ray Chandos for their incredible work preserving lands in the Trabuco Canyon area and staving off poorly planned developments through a variety of land use tools. Congrats! In December 2003, the 4th District Court of Appeal dismissed the County of Orange’s appeal of a superior court ruling that blocked the construction of the controversial Rancho Potrero Leadership Academy (RPLA) project, a detention center to be located in Trabuco Canyon. 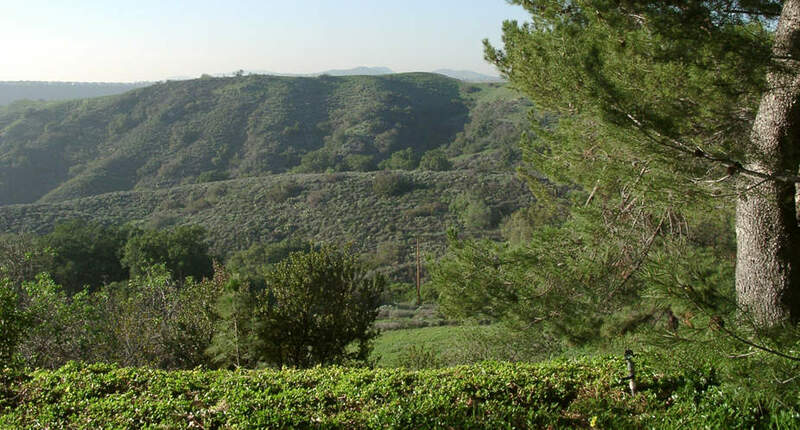 The dismissal was part of a settlement ending a three-year fight over RPLA between the County and Saddleback Canyons Conservancy and Rural Canyons Conservation Fund, two organizations devoted to protecting the rural canyon areas adjacent to the Cleveland National Forest. The challenged project involved two primary components: approval of a Public Facility Master Plan for a new 90-bed juvenile detention center and amendment of the Foothill/Trabuco Specific Plan (FTSP), which would have created an anomalous special district -- the "Joplin Boys Ranch District" -- for the explicit purpose of exempting the County-owned land from the FTSP's environmental resource protection provisions. 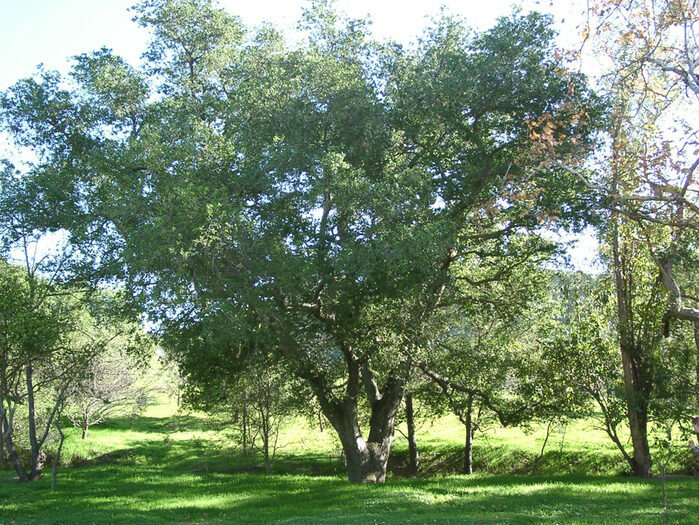 The project also would have included construction of a new paved access road in the Trabuco Creek floodplain leading to the Cleveland National Forest. The settlement affirms the August 2002 superior court ruling that the County violated the California Environmental Quality Act (CEQA) and state planning and zoning law when it approved RPLA and the FTSP amendment, calling the latter “arbitrary, capricious, and … ordered set aside as a prejudicial abuse of the County’s discretion.” The superior court also found that the County violated CEQA and the FTSP when it approved and commenced work on various maintenance projects at the existing Joplin Youth Center that resulted in the unlawful clearing of several acres of critical habitat. The County was stopped only after the plaintiffs documented the habitat destruction with a model airplane fly-over and reported it to state and federal authorities. The County was ordered to drop its approvals of the RPLA and the FTSP amendment. The $8.4 million grant from the State Board of Corrections, originally slated for the Trabuco Canyon site, but conditioned on compliance with state environmental law, has since been redirected for construction of a new youth facility at the Orange County Juvenile Hall Complex. Relocation to a site other than the pristine location adjacent to the national forest and Trabuco Creek had previously been declared impossible by County probation officials. Abiding by the superior court order, the County certified an Environmental Impact Report for the Joplin maintenance projects, and was ordered by state and federal resource agencies to remediate the destroyed habitat surrounding the Joplin Youth Center, plainly visible from miles away as a scar at the foothills of the Saddleback Mountains. In addition, as part of a negotiated settlement, the County paid $230,000 in attorneys’ fees to the citizens’ groups, which were represented by attorney Andrew Lichtman, and attorneys Rachel Hooper and Ellison Folk of the San Francisco law firm Shute, Mihaly & Weinberger. 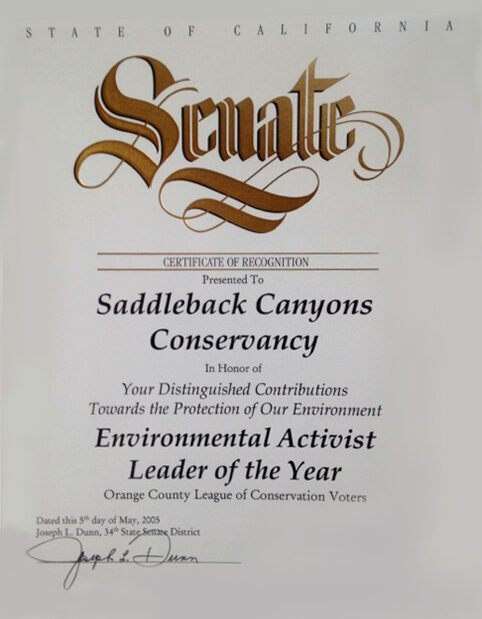 The Saddleback Canyons Conservancy was founded in 2001 to oppose the Rancho Potrero Leadership Academy. Since then, we continue to oppose projects that seek to undermine the Foothill/Trabuco and SilMod Specific Plans, and support projects that strengthen them. Please join us at an upcoming meeting, or contact us so you can become involved! 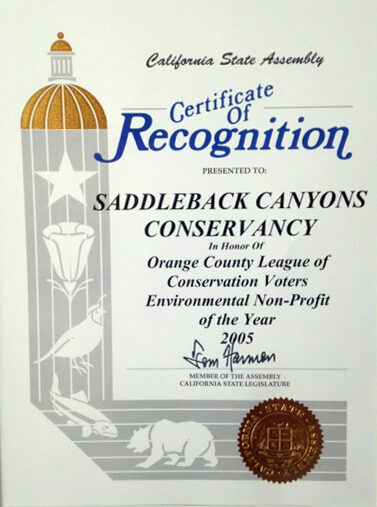 In the early 2000s, the Saddleback Canyons Conservancy helped broker an agreement between the TCA, NOAA and the landowner of the parcel at Live Oak and Santiago Canyon Roads (across from Cook's Corner). The parcel was planned to become a retail center, but cooperation and driving influence from the Trust for Public Lands and the Saddleback Canyons Conservancy changed that so the public can forever enjoy simple open space. The "Live Oak" parcel was dedicated by then Supervisor of the Third District Bill Campbell and officials from the TCA. The commemorative plaque stands today announcing this successful outcome - look for it on Santiago Canyon Road! To preserve the experience enjoyed by the public as they travel along the last unfettered highway in Orange County. Santiago Canyon Road is a scenic corridor that connects major Orange County urban areas to rural recreation areas. Santiago Canyon Road has been designated a “viewscape corridor” in the Orange County Strategic Traffic Plan. Santiago Canyon Road is frequented by a broad range of Orange County recreation and “vacation” enthusiasts. Santiago Canyon Road is a gateway to the Cleveland National Forest, picturesque canyon roads, mountain trails and byways. Commercial activities accessed via Santiago Canyon Road support and capitalize on recreation and getaway pastimes. Santiago Canyon Road should be preserved as a scenic corridor and be enhanced to improve public safety. The concept of multiuse components for Santiago Canyon Road were presented and approved in the SilMod Specific Plan. Create wildlife crossings to improve public safety and encourage wildlife activity. Provide turnouts for visitors and offer the opportunity to observe wildlife. Create multi-use trails for mountain bikes, road bikes, hikers and equestrians. Create a showcase of Orange County’s natural beauty. Santiago Canyon Road can be the centerpiece for the canyon areas and an example of rural preservation in a regionally urban environment. Create a safe and easy opportunity for all to enjoy this scenic and recreational treasure so close to urban/suburban life. Present a tribute to positive thinking and action by local government and concerned citizens.